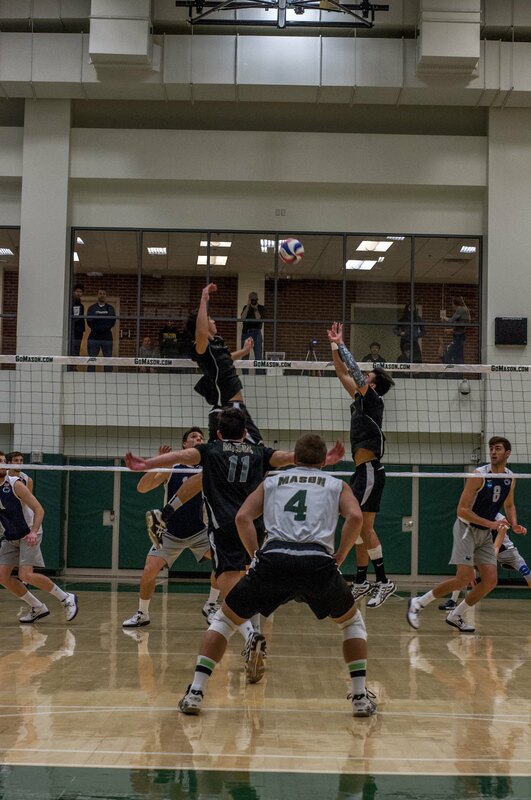 Mason men's volleyball fell to Penn State on Saturday night, 3-1 sets (photo by Walter Martinez). 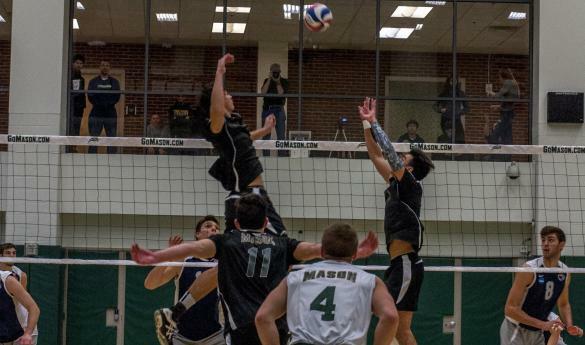 Mason’s freshman Radoslav Popov had a career- and game-high 24 kills. His classmate Christian Malias and redshirt sophomore Paco Velez also scored in double-digits, finishing the match with 12 and 11 kills, respectively. Malias also had 11 digs. Nick Goodell registered 16 kills for the Nittany Lions, while Aaron Russell contributed 13, including five serve aces. Matt Seifert added 12 kills and six aces on a game-high .688 attack percentage. Penn State began the match on the front foot and led 11-9 when Mason coach Fred Chao called a timeout. Coming out of it, the Patriots scored three straight points and took their first lead in the match with a block by Velez. Neither team could pull away until Russell stepped up to serve and allowed the Nittany Lions on a 9-0 run, taking a comfortable 24-16 lead. Although the Patriots went on a small run of their own, a serve error by Malias settled the set at 25-19 in favor of Penn State. Penn State grabbed an early 6-3 lead in the second set due to consecutive errors by Mason’s attacking line. The Patriots recovered and took the lead at 8-7, but later on the Nittany Lions started to pull away, forcing coach Chao to call a timeout at 15-10. Coming out of the huddle, Mason tied the score at 16 with a block by junior Stevens and then took the lead at 19-18 with a Popov kill. Penn State’s Russel’s serve again proved crucial to the outcome of the set, as the Nittany Lions went on a four-point run to take a 24-20 lead before winning the set 25-22. Mason began the third set better and maintained a lead until Russell tied the score at 9 with an ace. The Patriots regained the lead at 12-11 and it grew to five at 20-15. Penn State narrowed the deficit to just one point on several occasions at the end of the set, but ultimately Mason took the set 26-24. The Nittany Lions maintained a two-point lead from the very beginning of the fourth set and held it until a tip shot by Popov and a block by Stevens tied the score at 13. Penn State quickly regained it and their advantage extended to three at 20-17, but Mason never gave up and scored three consecutive points to tie the score. The Patriots then overcame two-point deficits at 22 and 24, but kills by Goodell and Seifert closed the set and match at 26-24. Next weekend Mason welcomes Harvard on Friday at 7 p.m. and Sacred Heart on Saturday at 4 p.m. after losing to these two opponents earlier in the season.